INDEX-6® is once again holding a key position in edible oils filling process automation in the Turkish edible oils sector. 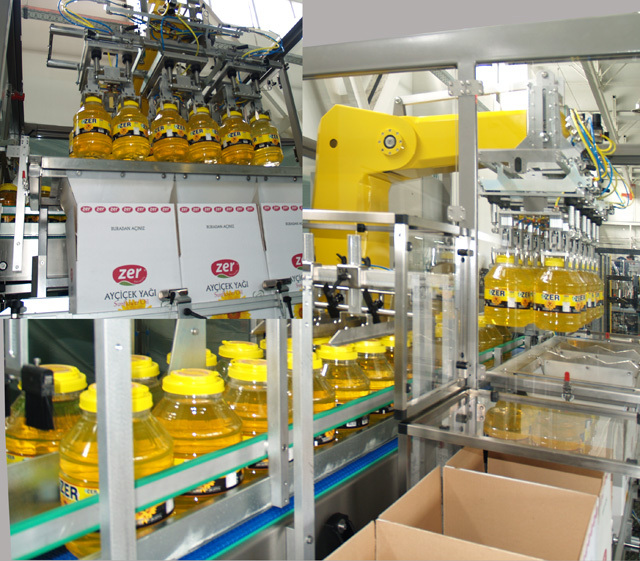 In 2014, three turnkey filling lines with weight dosing multiblocs from the PragmaticTM series were installed in a leading vegetable oil bottling factory. Two of the lines handle bottles of 0.75 L ; 1L and 2L and provide 12 000 bottles per hour output at each format. The third line is highly universal and is designed to process large containers – PET bottles of 4L and 5L with 48 mm screw cap, PET jars of 3.8L with 130 mm screw cap, as well as metal tins of 4L with press-on cap. The line output is 5000 containers per hour at 5L volume. The core of the line is a multibloc with weight filling turret with 26 heads with Dp = 2080 mm and pitch = 251 mm. Capping is done on just one capping turret fed by two feeders and two Pick & Place systems. Precise container alignment for capping is guaranteed by a special device patented by INDEX-6 in 2014. The lines continue with the most appropriate labellers and robotized cartooning systems. All three lines follow the core concept of immaculate hygiene during filling and maintenance, extra high accuracy and uncompromised quality at a fair price.